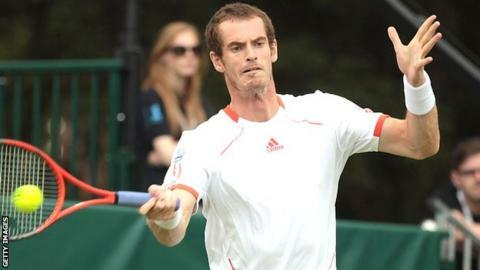 Andy Murray will begin his Wimbledon campaign against former world number three Nikolay Davydenko on Tuesday. World number four Murray is in the same half of the draw as second seed Rafael Nadal,who has beaten the Scot in the last two Wimbledon semi-finals. Top seed Novak Djokovic faces Juan Carlos Ferrero and could meet Roger Federer in the last four. Britain's Anne Keothavong plays Laura Pous-Tio on Tuesday, with top seed Maria Sharapova starting on Tuesday. Sharapova, who won Wimbledon as a 17-year-old in 2004, faces Anastasia Rodionova of Australia in the first round and she cannot meet second seed Victoria Azarenka or four-time champion Serena Williams until the final. Azarenka takes on Irina Falconi of the Unites States and sixth seed Serena plays Barbora Strycova Zahlavova. British interest on the first day rests with Heather Watson, who meets 52nd-ranked Iveta Benesova, and wildcards Johanna Konta and Naomi Broady, up against Christina McHale and Lourdes Dominguez Lino respectively. "This is a tricky section of the draw for Murray, starting with the former world number four who beat him several years ago at the US Open but is past his best. After that it will be 6ft 10in Ivo Karlovic and his massive serve and maybe in round three it's Marcos Bagdhatis or Kevin Anderson or Grigor Dimitrov - there's a lot of talent there - and he's in David Ferrer's quarter and Rafa Nadal's half." Joshua Goodall drew fellow wildcard Grega Zemlja and 19-year-old Oliver Golding plays Igor Andreev. Tuesday sees British number two Elena Baltacha face a player ranked eight places below her in Italy's Karin Knapp, while Laura Robson takes on 2010 French Open champion Francesca Schiavone. "I have never played her before and I actually don't know very much about her, which is quite strange really because we've both been around a while," said Baltacha. "It's not a bad draw at all but everyone can play and everyone badly wants to win every match at Wimbledon, so I'll need to be ready. "My neck has been getting better slowly since I pulled out of Eastbourne and there has been a big improvement in the last day or so. I'm having lots of physio on it and I'm very optimistic that I'll be fine for Tuesday." British number two James Ward plays world number 36 Pablo Andujar and Jamie Baker will hope to cause an upset against out-of-form three-time finalist Andy Roddick. Defending champion Petra Kvitova was paired with Akgul Amanmuradova of Uzbekistan, seventh seed Caroline Wozniacki has a tough test against Tamira Paszek and four-time Grand Slam winner Kim Clijsters, in her last Wimbledon appearance, faces 18th-seeded Jelena Jankovic of Serbia. Murray but leads Davydenko 5-4 in the career head-to-head going into their first meeting on a grass court. While the Russian has four Grand Slam semi-finals to his name - and won their only previous meeting at a Grand Slam, the 2006 US Open - he is now ranked 47th and has never been beyond the fourth round at the All England Club. Murray's projected route to the final sees him play Davydenko, two big servers in Ivo Karlovic and Kevin Anderson, Richard Gasquet, his French Open conqueror David Ferrer, Nadal and Djokovic. It is the eighth time that six-time champion Federer, who faces Albert Ramos in his opening match, has been placed in Djokovic's half of the draw, while Nadal starts against Thomaz Belluci on Tuesday. David Nalbandian, plays eighth seed Janko Tipsarevic and 2011 semi-finalist Jo-Wilfried Tsonga has an intriguing encounter with 2002 winner Lleyton Hewitt.